... couldn't resist, just trying to inject a little levity to the situation. That's one of my ferrets aka furry little monsters - JLo, so named cuz she's got a big booty & steals bling & electronics (including cell phones). She's a sweetheart & charms the pants off anyone. Sorry to hear about your trials & tribulations at the DMV. Sure sounds like you're right, you gave them a little TOO much information & they turned it against you. Doubtful there's any recourse, but I might have a little good news. Once you're in the system, you may be able to avoid future waits for renewals. I just renewed my plates/tags for the next year & did it all online, took about 5 minutes & the tags showed up about a week later. At least they're doing SOMETHING right, even if it is in cyberspace. Highly recommended. Last edited by delgadobb; 09-15-2010 at 03:06 AM.. 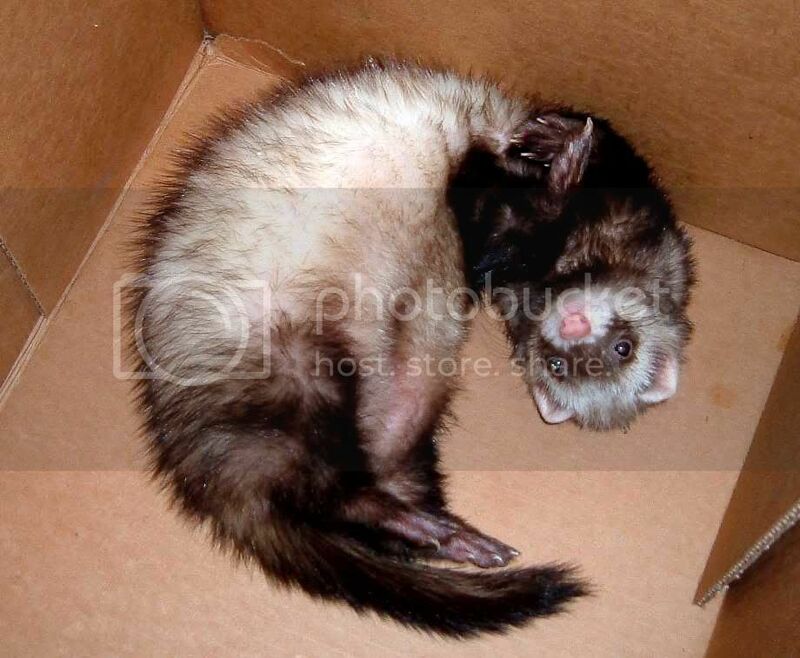 I used to have a great ferret named Fraggle. He was a hoot. I got a frantic call from a neighbor that there was a wild animal in her yard. She screamed when I walked up and just grabbed him. She had never seen a ferret and Fraggle was just there for the cat food. We think he had been abandoned by his original owner. We had him for years until he finally died of old age. He would crawl all over our great dane. He loved that dog. Maybe we do need a national ID card so we can get rid of all this mess. Ironic that you should suggest that. All of those increased documentation requirements are the fallout of the move toward a national ID. If it weren't for the REAL ID Act's requirements to establish drivers licenses as a de-facto national ID (by linking all the states' DMV databases together and to hundreds of other federal systems) we wouldn't have to go through all of this hassle in the first place. What's worse is that the impact to law-breakers is minimal - terrorists, illegal aliens and other criminals will still forge IDs or bribe low-paid clerks to put false entries in the ID databases - only the law-abiding must suffer the burden of compliance. The good news is that Orwell was wrong, the bad news is that Kafka was right. I don't know if what you say is correct or not, but you stated it brilliantly! I'm not the first to refer to the post-9/11 mess we built for ourselves as Kafkaesque, I don't recall anyone else using that particular phrasing though.